There is a lot that can be said about Motherhood; some would define it as the biggest achievement, others as the biggest challenge. Some, instead, would argue that it is so subjective it can’t even be described – just experienced. 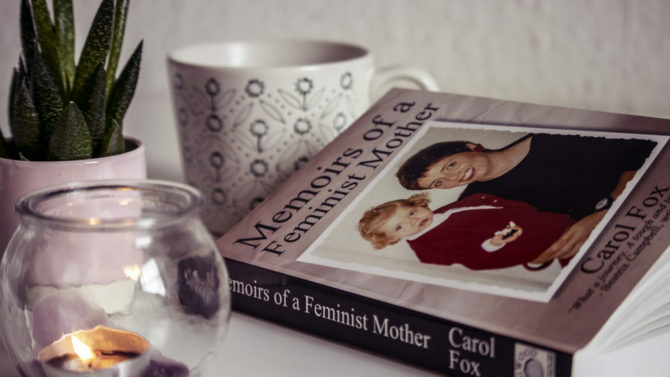 With Memoirs of a Feminist Mother, Carol Fox manages to draw together all the achievements, challenges and experiences of her own motherhood, and brilliantly shares them with her readers. The book works as an account of her personal journey, which starts when she was only a child. Despite being brought up in a Catholic and protective environment, she had always been aware of the cultural inequalities that come with being a woman. Carol’s caring nature and political tendency led her eventually into social work first and into law practice later, but the turning point of her life came with her serious fertility problems. It was at this crucial point that she realised what she wanted more than anything else: she wanted to become a mother. What followed was years of fights against the bigotry of Scottish prejudices about being not only a single parent, but also a woman who conceived her child thanks to fertility treatment. Her feminist- claimed personal journey inevitably turns into a generalised experience, a fight that the reader can’t help but support and sympathise with. With a thorough account of the events that characterised her fertility cycles, Carol Fox writes about the obstacles she encountered during her journey and the incredible strength she armed herself with in order to overcome them. The real and – almost – brutally honest language she uses is a perfect literary fit for her story, whose events mainly occurred in the late 80s and early 90s, but nonetheless still feel relevant today for several women. An engaging and emotional book which, despite being frustrating at times – due to the author’s unfair and painful experiences –, still manages to arise hope in the female readership. Moreover, what makes Memoirs of a Feminist Mother an even more valuable read is its educational value, which has become rare in contemporary literature. A must read for all the daughters, mothers and women out there!